Mukesh will host the malayalam quiz show sell me the answer on asianet. The channel had started showing the promo of the same. We have posted about the show Sell me the answer here, its started the registration process. Season 3 of Ningalkkum Akam Kodeeswaran will end soon and Asianet will start this program. Mukesh is currently doing another program in Asianet named Badai Banglaw , which is a very popular show. Mukesh is a popular film actor and he is kollam district. Mukesh is the son of O Madhavan and Vijayakumari, baloon was his first movie. This is not the first time he is hosting a game show. Mukesh hosted the game shows Kodeeswaran (Malayalam) and Deal or No Deal in Surya TV. You can check for more details of Sell me the answer and check how can you participate on the same. Stay tuned here for more details about Sell me the answer quiz show. We will post more details of Sell me the answer malayalam quiz show here. Asianet is the most popular malayalam channel and they are showing popular malayalam serials, reality shows etc. 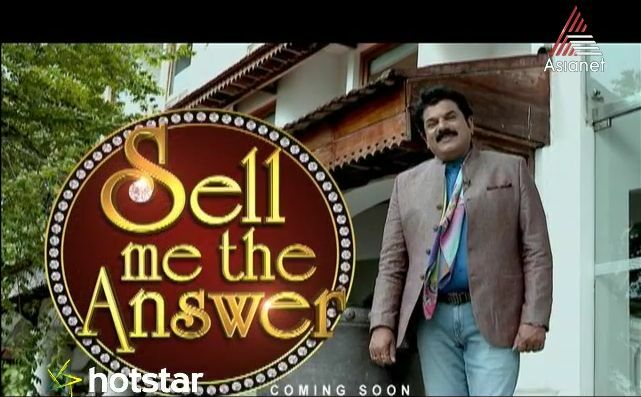 Sell me the answer will be another great show for the malayalai viewers from Asianet. Shame to Tijo Thomas who doesn’t know the national song of India.Who selected this boy who seized a lumpsum money without knowing anything. It should be trimmed at the grassroot level. Yesterday(22nd July) he humiliated a lady,teacher &prior to that he commented’I fear teachers’.SHAME>>>>>>>>SHAME………….. I very much like Mukesh Sir’s – Sell me the answer – programme – his presentation, stories,handling pogramme, etc.etc. Only one rule i.e. when a trader gives wrong answer, the trader and participant , goes out. My small suggestion that when such thing happens, the trader should give back half the amount he received from participant, so that the trader does not feel guilty , also the participant feels happy with this gesture. I will be happy if such rule change comes in sell me the answer programme.